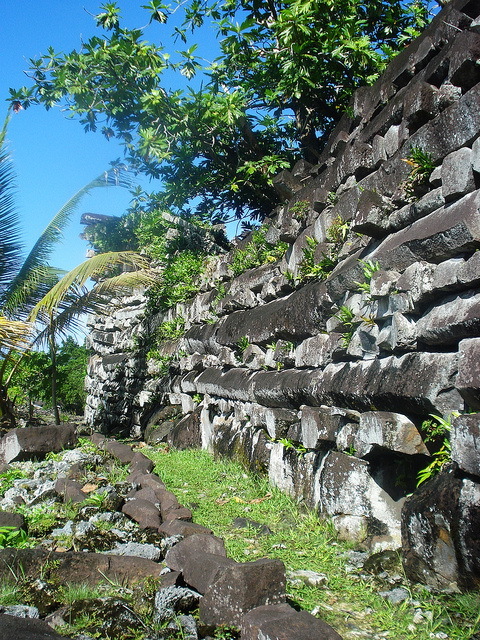 Nan Madol is a ruined city located in the remote island of Pohnpei. 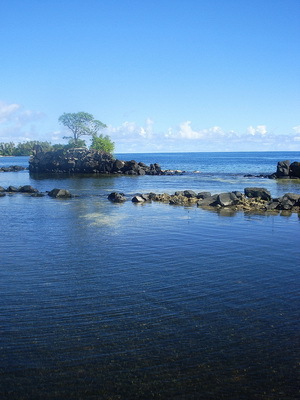 The ancestors of Micronesians called these basalt ruins Soun Nan-leng, meaning the Reef of Heaven. The site consists of vast numbers of fallen temples, ancient tombs and bath houses which come towering out of the water. The ruins were built on ninety-two artificial islets, stretching out nearly a mile in length and a half-mile in width. The islets are surrounded by narrow stretches of water, resembling canals, so it's not surprising that Nan Madol is sometimes referred to as "the Venice of Micronesia." One part of the city, built from basalt columns, was for priests and rulers; the other half was the administration center. It comprised temples, burial vaults, meeting houses, public baths and pools for turtles, fish and eels. No one in Pohnpei knows exactly how Nan Madol was built or why the early inhabitants undertook such a mammoth task, but islanders swear ancient kings known as Nahnmwarkis used magic. Scientists say the basalt boulders, some as heavy as 50 tons, were transported by rafts to Nan Madol from the other side of the island and levered into place with palm tree trunks. The boulders were dragged inch by inch up log ramps before being piled one atop the other, they said. No mortar was used to hold them together. The rock structures reach as high as 16 meters on Pohnwi islet. Construction by thousands of workers probably took hundreds of years. Scientists estimate the ruins are about 900 years old and believe they are the only such structure in the dozens of islands scattered across the Pacific basin. The main structures have been compared with the ceremonial squares built by the Mayans and Aztecs of Central America. The city's grandeur must have awed visitors arriving to trade or bring tribute. Nan Madol was a religious center and was inhabited by the kings of Pohnpei until it was abandoned in the middle of the 19th century. The rites performed within the towering walls remain a mystery. There is some evidence the temples produced the ceremonial drink sakau, still used by the people of Pohnpei to sanctify their rites. In 1985, Nan Madol was designated by the U.S. Interior Department as a National Historical Landmark, the only such site in the Federated States of Micronesia, which has an agreement with Washington for defense and financial support. Parts of Nan Madol have crumbled over the last 200 years, with occasional typhoons blowing fragments into the sea. Sturdy mangrove trees and shrubs that cover parts of Nan Madol have damaged the walls. Micronesia wants to join the United Nations and officials say they hope organizations such as UNESCO (U.N. Educational, Scientific and Cultural Organization) will provide funds to help restore Nan Madol as a cultural and historical site.